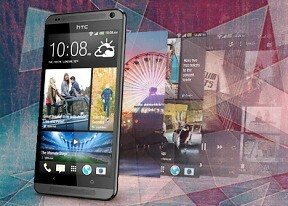 As an integral part of Android Jelly Bean Google Now is available on the HTC Desire 700 dual sim. You can launch it by holding the home button. In addition to being able to recognize voice commands, Google Now will learn from your usage patterns, and display relevant information. For example, if you search for a particular sports team frequently, Google Now will serve information for upcoming games you might want to watch. The service interacts with you by generating cards which are displayed on your screen and give you a short overview of information it believes is relevant to you. Going to work in the morning? Google Now knows this and lets you know there's a big traffic jam on your usual way to the office, and will offer you an alternate route. This extends to a multitude of other areas, including weather, traffic, public transit stations, and nearby points of interest. You can either type or talk to Google Now and the app will give you one of its aforementioned info cards (if available) and read you its contents aloud (you can disable this in the app settings). If there's no card to help with the answer to your question, Google Now will simply initiate a Google web search instead. There is also a Google Now widget, which generates information for you based on what your interests are. You can put it on the lockscreen for at-a-glance info. The People app in Sense 5 has seen some minor changes too. Instead of clickable tabs at the bottom of the screen you get side-scrollable tabs on the top, which is a more convenient solution (and along the lines of stock Android). You get the dialer, all contacts, groups (including favorite contacts there), as well as a call log. Once again, you can reorder tabs and remove the ones that you don't need (Groups or Call history). Since the HTC Desire 700 dual sim has an extra SIM card slot, the software has been obliged to deliver the extra functionality. Firing the contacts app for the first time prompts you which contacts to be displayed. From a drop-down menu at the top, you can filter contacts based on where they came from - the phone's address book, Facebook, Twitter or your HTC Sense account. If an account has multiple subgroups (e.g. Gmail's groups), they can be toggled individually as well by tapping the ellipsis button. The second tab holds the texts, emails and call history between you and the given contact. The next one displays social networking contact updates, and finally the "Gallery" pulls the albums that contacts have created on Flickr and Facebook. These tabs can be hidden and rearranged too. When editing a contact, you start off with just one of the essential fields but you can easily add more. If a contact is linked with a Facebook or other account you can see them either merged or choose to view either profile. In fact, the phone will automatically suggest to do that when it thinks two entries are for the same person. A handy option is Block contact - the Desire 700 dual sim will block all calls, texts and other messages from that contact. You can add any number too, which is great if you get spam messages from an automatic number. You can later check the call and message history from those contacts and get them out of the dog house if you like. The HTC Desire 700 dual sim did great in our signal test, providing stellar reception in environments where there is the occasional dropped call. The volume in the earpiece was sufficiently loud (we almost never used it at full volume) and voice clarity was really good. The dialer on the HTC Desire 700 dual sim displays your recent calls with the usual tabs above, accessible via side-swipes. There's smart dialing on the Desire 700 dual sim - once you start typing on the keyboard, contacts will be filtered by name or by phone number. You can even switch to a QWERTY keyboard instead of the phone keypad. Another nice feature is the button that unveils all the contact info and lets you do just about anything - send an email, assign a custom ringtone and so on. It's a handy way to find and do something with the right contact, not just for dialing. A nice touch is the call button, which is now split in two allowing you very easily to dial a person with either of the two SIM cards. The only problem we have with the smart dial is that it only suggests one contact at a time - if you want another one (e.g. both Dexter and Dee Dee match "de" or "33"), you have to keep typing until you find the right one, you can't just pick out of a list of 3-4 matching contacts as on most other phones. Yet another option is voice dialing, you hit the button, wait a couple of seconds for the Desire 600 dual sim to get ready and say "Call Dexter". This is a little too slow for our liking though (the phone says "Just one moment", pauses, "Say a command when you're ready" and then you can talk). The HTC Desire 700 dual sim doesn't support video calling over the cellular network by default. The good news is there are a bunch of apps which could fill in the blank spot with video calling over Wi-Fi and 3G. The handset packs the standard set of accelerometer-based tricks - turning the phone in the middle of a call will enable the loudspeaker, Quiet ring on pickup will reduce the loudness of the ringtone when you move the phone and Pocket mode boosts ringtone volume if the phone is in your pocket or purse. The focus of BoomSound speakers is not absolute loudness but quality of the sound. The Desire 700 dual sim mini scored a Good mark with results very similar to that of the regular HTC One, so HTC didn't skimp on the speakers. While the Desire 700 dual sim is not the loudest around, it's one of the most pleasant to listen to. You can find more on the testing procedure here. Android and the HTC Desire 700 dual sim are capable of handling all sorts of messages - SMS, MMS, email. Social networking is covered by several apps and widgets, and there's Hangouts, which can connect you to Google's chat network. To add recipients, just start typing a name or number and choose from the contacts offered. The compose box covers about a fifth of the screen in portrait mode or half in landscape. The keyboard is pretty nice. Keys are well spaced but the overlay doesn't include any gaps between them, which is only a cosmetic feature and poses no discomfort. The 5" diagonal offers ample space for comfortable typing. Some keys can be long pressed to get additional symbols, which speeds up typing in some cases as you don't have to keep going back to the symbols section of the keyboard. A tap-and-hold on the text box gives you access to functions such as cut, copy and paste. You are free to paste the copied text across applications like email, notes, chats, etc. and vice versa. You can also enable arrow keys, which show up below the portrait keyboard (but not the landscape one). Prediction is available, even prediction for the next word you're about to type. When the phone has learned from you, it can get pretty good at guessing and saving you whole words. You can edit a personal dictionary of words and backup and restore it either to local storage or to an email account. HTC has included the Trace keyboard, which acts like Swipe. You drag a finger over the desired keys and the phone predicts what you're trying to write. It works really well but language support is limited. Voice transcription is also available. The HTC Desire 700 dual sim comes with two email apps - the traditional Gmail app and the built-in HTC Mail app, which merges all your email accounts into a single interface. The Gmail client has the trademark conversation style view and can manage multiple Gmail accounts. Batch operations are supported too, in case you need to handle email messages in bulk. The Mail app has tabs like many other Sense 5 apps. You can choose the Filters setting and show/hide the ones you want or rearrange the visible ones. You can choose from All, Favorites, Unread and Attached (hidden by default). There's hardly anything we can think of that the HTC Desire 700 dual sim lacks in terms of email capabilities. The settings for popular email services are automatically configured. POP/IMAP accounts and Active Sync accounts are supported.